high-quality service, ensuring the liferaft is fit and ready for emergency deployment. We operate a collection and delivery service in the Falmouth/Penzance areas with drop off points at or near all the marinas and boatyards. Owners are also welcome to watch their liferaft being inflated and checked. 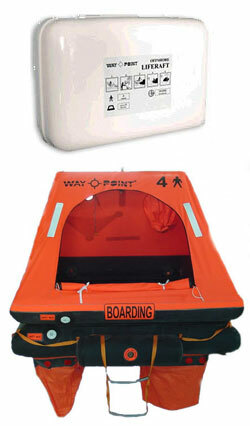 A life raft is one of the most important pieces of safety equipment on board a vessel. It has been designed, tested, and approved to save your life in an emergency. An annual inspection ensures that your liferaft will perform and operate as designed. Different liferafts have different servicing requirements. Most leisure liferafts need to be serviced every three years, with commercial liferafts requiring an annual service. During the inspection, the liferaft is inflated and pressure tests are carried out. The inflation system is checked and reset. If the cylinder is due for a hydrostatic test, we can undertake this in-house. The general condition of the liferaft is also checked, as is the emergency pack where any expired items are replaced / updated. All equipment is checked and logs completed. Any repairs needed to the liferaft or container are carried out. When the liferaft has passed all the pressure tests to the manufacturers specifications, the liferaft is re-packed into its container and sealed and a certificate of service issued. All liferafts are different and service prices vary. Our prices are very competitive, for an estimate please call us on 01326 280789 or email us at info@swliferafts.co.uk.